The U.S. is going to experience more and more deadly heat waves as climate change progresses, a new study finds. And they're going to hit in areas where population is rapidly growing. For a large swath of Americans, in other words, outdoors time is projected to become increasingly intolerable. 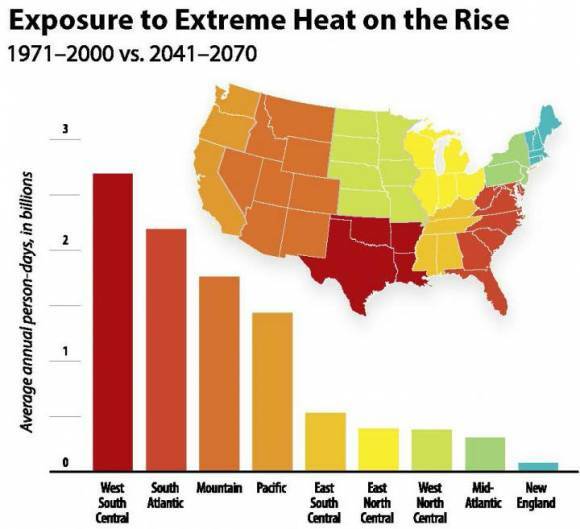 The study, conducted by researchers at the National Center for Atmospheric Research (NCAR) and the City University of New York (CUNY) and published in the journal Nature Climate Change, looks ahead to the middle of this century, at how global warming and population growth will combine to expose an increased proportion of Americans to extreme heat: the number of days when the temperature reaches 95 degrees Fahrenheit or higher. They then translated that into "person-days," a number which accounts for just how many people are expected to be living in the areas where the extreme heat will be felt. Booming cities like Atlanta, Charlotte, Dallas, Houston, Oklahoma City, Phoenix, Tampa and San Antonio are expected to be hit hardest. "Both population change and climate change matter," study co-author Brian O'Neill explained in a statement. "If you want to know how heat waves will affect health in the future, you have to consider both." Extreme heat can certainly be dangerous -- according to the study's release, its the deadliest weather-related event in the U.S. But the study "does not say how vulnerable or not people might be in the future," O'Neill cautioned. "We show that heat exposure will go up," he continued, "but we don't know how many of the people exposed will or won't have air conditioners or easy access to public health centers, for example." How we adapt, in other words, matters. "There has been so much written regarding the potential impacts of climate change, particularly as they relate to physical climate extremes," said Bryan Jones, the study's lead author. "However, it is how people experience these extremes that will ultimately shape the broader public perception of climate change." Those of us who work indoors, or who exist largely on the Internet, might not notice much of a change at all -- although we all may feel the impact of increasing numbers of people cranking up the AC. Other studies, though, have focused on outdoor workers, who may find themselves at a heightened risk of illness and injury. The only thing we can be sure of, for now, is that if we don't make any major reductions in greenhouse gas emissions, the heat will continue to rise.